Drive to Zululand , passing the rolling hills of sugar cane fields and forest plantations. Short stop at Babanango. 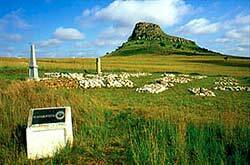 Visit the sites of the battlefields of the Anglo-Zulu war of 1879 . At Isandlwana, audio-visual presentation followed by site visit. Rorkes Drift including the restored hospital building and an audio presentation. Lunch and site visit at Fugitive's Drift. Return to Durban via Tugela Ferry and Greytown.